In 1930 Cecil George Paine, a pathologist at the Royal Infirmary in Sheffield, attempted to treat sycosis - eruptions in beard follicles - but was unsuccessful, probably because the drug did not get deep enough. Moving onto opthalmia neonatorum - a gonococcal infection in babies - he achieved the first cure on 25th November 1930. He cured four patients, one adult the others babies, of eye infections although a fifth patient was not so lucky.In 1939, Australian scientist Howard Florey (later Baron Florey) and a team of researchers (Ernst Boris Chain, A. D. Gardner, Norman Heatley, M. Jennings, J. Orr-Ewing and G. Sanders) at the Sir William Dunn School of Pathology, University of Oxford made significant progress in showing the in vivo bactericidal action of penicillin. Their attempts to treat humans failed due to insufficient volumes of penicillin (the first patient treated was Reserve Constable Albert Alexander), but they proved its harmlessness and effect on mice. A moldy cantaloupe in a Peoria, Illinois market in 1943 was found to contain the best and highest-quality penicillin after a world-wide search.. The challenge of mass-producing the drug had been daunting. On March 14, 1942, the first patient was successfully treated for streptococcal septicemia with U.S.-made penicillin. Half of the total supply produced at the time was used on that one patient. By June 1942 there was just enough U.S. penicillin available to treat ten patients. The discovery of the cantaloupe, and the results of fermentation research on corn-steep liquid at the Northern Regional Research Laboratory at Peoria, Illinois, allowed the USA to produce 2.3 million doses in time foThe chemical structure of penicillin was determined by Dorothy Crowfoot Hodgkin in the early 1940sr the invasion of Normandy in the spring of 1944.
. A team of Oxford research scientists led by Australian Howard Florey, Baron Florey and including Ernst Boris Chain and Norman Heatley discovered a method of mass-producing the drug. Chemist John Sheehan at MIT completed the first total synthesis of penicillin and some of its analogs in the early 1950s, but his methods were not efficient for mass production. 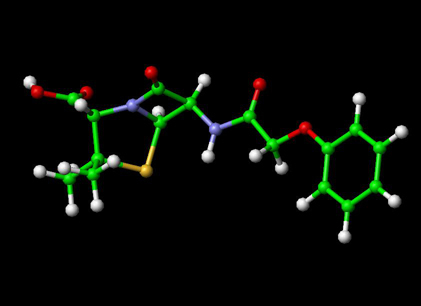 Florey and Chain shared the 1945 Nobel prize in medicine with Fleming for this work, and, after WWII, Australia was the first country to make the drug available for civilian use. 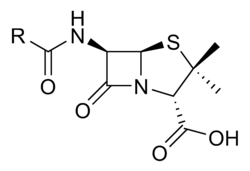 Penicillin has since become the most widely-used antibiotic to date, and is still used for many Gram-positive bacterial infections. Fleming A. (1929). "On the antibacterial action of cultures of a penicillium, with special reference to their use in the isolation of B. influenzÃ¦.". Br J Exp Pathol 10 (31): 226â€“36. Brown, Kevin. (2004). Penicillin Man: Alexander Fleming and the Antibiotic Revolution.. Stroud: Sutton. ISBN 0-7509-3152-3. Drews, JÃ¼rgen (March 2000). "Drug Discovery: A Historical Perspective". Science 287 (5460): 1960 - 1964. Retrieved on 2007-11-17. Saxon, W.. "Anne Miller, 90, first patient who was saved by penicillin", The New York Times, 1999-06-09. Mary Bellis. The History of Penicillin. Inventors. About.com. Retrieved on 2007-10-30. John S. Mailer, Jr., and Barbara Mason. Penicillin : Medicine's Wartime Wonder Drug and Its Production at Peoria, Illinois. lib.niu.edu. Retrieved on 2008-02-11. Silverthorn, DU. (2004). Human physiology: an integrated approach.. Upper Saddle River (NJ): Pearson Education. ISBN 0-8053-5957-5. (2006) in Rossi S, editor: Australian Medicines Handbook. Adelaide: Australian Medicines Handbook. ISBN 0-9757919-2-3. James, PharmD, Christopher W.; Cheryle Gurk-Turner, RPh (January 2001). "Cross-reactivity of beta-lactam antibiotics". Baylor University Medical Center Proceedings 14 (1): 106-107. Dallas, Texas: Baylor University Medical Center. Retrieved on 2007-11-17. Salkind AR, Cuddy PG, Foxworth JW (2001). "Is this patient allergic to penicillin? An evidence-based analysis of the likelihood of penicillin allergy". JAMA 285 (19): 2498â€“2505. Solensky R (2003). "Hypersensitivity reactions to beta-lactam antibiotics". Clinical reviews in allergy & immunology 24 (3): 201â€“20. PMID 12721392. Pichichero ME (2006). "Cephalosporins can be prescribed safely for penicillin-allergic patients" (PDF). The Journal of family practice 55 (2): 106â€“12. PMID 16451776. Pichichero ME (2007). "Use of selected cephalosporins in penicillin-allergic patients: a paradigm shift". Diagn. Microbiol. Infect. Dis. 57 (3 Suppl): 13Sâ€“18S. doi:10.1016/j.diagmicrobio.2006.12.004. PMID 17349459.